When Facebook in 2014 expanded its gender-identification drop-down box to 56 options, it was only the latest expression of the company’s progressive bona fides. But in bringing terms like “pangender” and “two-spirit” from the fringe to the mainstream, the tech company ignited a brief match in the culture war, welcoming snarky dismissals from conservative-media wags and plenty of harrumphs from flyover-country traditionalists. While the coastal elite warmed to the decision, it turned out plenty of people preferred the binary, not the buffet. Elise Forier Edie’s solo show The Pink Unicorn, which debuted a year ago, places us in the headspace of one such conventionalist, a widowed mother in a small—and small-minded—Texas suburb who transforms into an unwitting advocate for gender liberation. As portrayed by Laura Turnbull in Primal Forces’ always engrossing but occasionally sputtering Southeastern premiere, Trisha Lee’s cultural awakening is rooted in family: Her 14-year-old daughter Jolene has suddenly declared herself to be genderless. And also genderqueer. And pansexual. And an androgyne, rebelling against the “fascist empiricism of the two-gender model,” terms that never entered Trisha’s cerebral cortex until her daughter’s announcements spurred a visit to Wikipedia. Trisha doesn’t understand Jolene’s new identity, not really, but the love for her offspring is undiminished, and it forces her to choose between Jolene (now referring to herself as the gender-neutral Jo) and her community bonds. It turns out it’s not so easy to have a genderqueer child among the white picket fences of Sparkton, Texas, where churches outnumber minority residents. Following her daughter’s announcement, she sees intolerance everywhere from the bully pulpit of the town’s cowboy-hat-wearing pastor to the small-minded ideals of her mother, a designer-scarf-wearing southern belle. Under Genie Croft’s fluidly paced direction, The Pink Unicorn plays like a confessional monologue to a roomful of confidants. 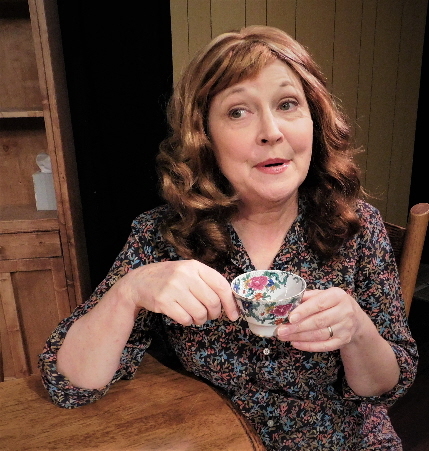 Turnbull is delightful company as she traverses her character’s modest home, whether folding laundry in the living room, enjoying a cold glass of sweet tea at her kitchen table or pondering the skies from her back porch. (Only once, when Turnbull crouches in front of her porch railing for an extended seated monologue, does the blocking hamper, rather than support, the content; many Empire Stage patrons may be craning their necks for a decent view.) She paints vivid pictures of her town’s backward antagonists and ragtag supporters alike, from Shug, a butch lesbian with a healthy appetite, to Principal Makepeace, a man of three-to-four chins and an icky obsession with violet hand cream. But the performance is far from flawless, and likely would have benefited from more than two previews. The Pink Unicorn is 48 punishing pages of text, albeit with an intermission, and Turnbull was still ironing out the bumpier passages on opening night, with more flubs than we’ve come to expect. Not all of her character’s linguistic flourishes landed the way they should, and there were times when she seemed to be searching for the next word. In the broader sense, though, she is very much this character, with an ingrained sense of southern hospitality and a command of down-home physical gestures and vocal cadences that couldn’t be further removed from her fast-talking attorney in Zoetic’s Wrongful Death and Other Circus Acts back in January. David Hart’s sound design complements the storytelling with atmospheric audio effects that I could take or leave—at its nadir, there a truly egregious sample of schmaltzy piano music that undercuts the play’s most emotional scene, doing a disservice to Turnbull and the audience alike. But Nate Sykes’ evocative lighting design is a definite positive, particularly in the production’s second act: He showers the stage in midnight blue for a climactic mother-daughter conversation, a harsh red during Turnbull’s memorable bender at a nearby bar, and a Shape of Water green for Jo’s inspiring student protest. All of it helps contribute to a play that, perhaps more than it did in 2013, crystallizes the xenophobia that too-often raises its head in a country riven by tribalism. On a more sanguine note, it embodies the liberal hope that with a little education about, or first-hand experience with, the Other, lasting enlightenment is possible. Primal Forces’ The Pink Unicorn runs through July 8 at Empire Stage, 1140 N. Flagler Drive, Fort Lauderdale. Performances run Fridays and Saturdays at 8 p.m. and Sundays at 5 p.m. Tickets cost $30. Visit primalforces.com. This entry was posted in Performances, Reviews and tagged Elise Forier Edie, Genie Croft, Laura Turnbull, Primal Forces Productions, The Pink Unicorn. Bookmark the permalink.